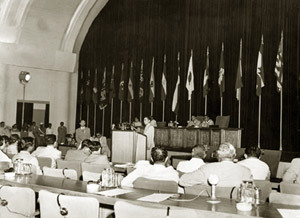 A week ago, I realized that the 50th anniversary of the Bandung Confererence (the first Afro-Asian Summit in Bandung, Indonesia) had come and gone. There was no real mention of the anniversary in the papers. The blogosphere ignored it, including on its left-wing. Speaking of the left, neither Z Magazine, nor Counterpunch.org, nor The Nation had anything on it, at least that I could find. I found one article in Le Monde Diplomatique, on the lost illusions of Bandung (subscription required). What surprised me was that it was passed over in relative silence by the media in the Third World itself. The Indian press, which I occasionally look at, said very little. The pieces that were in places like Al-Ahram, which I also occasionally look at, read more like encyclopedia entries telling their readers of the event, or used the anniversary of the Bandung Conference as a frame to discuss American power and its wars. One exception seemed to be the Chinese press, which did say a lot, which in turn was odd since China had been the odd one at Bandung in 1955—so many of the participants were suspicious of or hostile to Communism. Abdel Nasser, with his hatred of Communists, hadn’t recognized the PRC, and wouldn’t do so until 1956. Still, Hu Jintao, Manmohan Singh, and Susilo Bambang Yudhoyono stood and walked in place of Zhou En Lai, Jawaharlal Nehru and Sukarno, with no one to stand in for Abdel Nasser. Three years earlier in 1952, Sauvy, writing of this region that was lost in what had become the Cold War, had called on the rest of the world to take note of the newly decolonized and decolonizing states, “...because, this ignored, exploited, scorned Third World like the Third Estate, wants to become something too.” Nowadays it seems that the countries that make it up would like the Third World to be forgotten, after the decades of non-aligment, aligment, coups, wars, posturing, degenerations of societies into personal fiefdoms, and, in its worst moments, a murderous local fascism, at times justified with the rhetoric of Third Worldism. Or I should say that they would like the Third World to be forgotten, save in the most anodyne form possible. A strange cause of a birth, and a strange thing to be born. But it was a birth nonetheless, by an experience that captures the vast majority of humanity. So, I offer a belated but sincere Happy 50th birthday to the Third World!